Before retiring last thing at night I sometimes open the bathroom window and drink in the night air, enjoying the peace and quiet. A few nights ago, there was a nice mist hanging over the scene and I decided to finish off a roll of Silvermax in my OM2 by sitting the camera on some towels on the window ledge and making a couple of exposures. The exposure for this one must have been around a minute or so - I just put the camera on auto, added a bit of exposure compensation and fired away using the self timer. The thing that attracted me to the shot was the street lights on the leaves just to the right of the house on the left hand side of the frame. They had an ethereal look about them. When it came to scanning the neg, however, my scanner was acting up so I had to use a 28-105 macro zoom on the D700 to "digitise" it. The sepia tint was added to the highlights in Adobe Lightroom. It's not the sharpest photograph I've ever taken but, all things considered, it's not too bad. That's great Bruce - real atmosphere - that haar has been something else hasn't it! Yeah, I like this too. But how do you determine the exposure? Some how, maybe I'm shooting too early, but I get too much sky and not enough subject. Only problem I have with it is the intrusion of reality on the lower right - trash container signs. I think it's a bit of a nightmare metering night scenes. 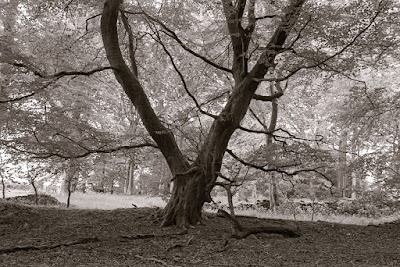 My OM2, at longer exposures, meters the whole scene and comes up with an averaging exposure. I just put the camera on auto and give it two stops extra using the exposure compensation dial. Usually works for me but maybe not for you depending on what camera you use. The OM2 can meter down to -5 EV which is a great boon. And they're cheap enough that picking one up with a standard lens might be an idea if you're keen on night photogaphy. I love OM-2 cameras, I got loads of them. I even cut old spectacles up and place them in the viewfinder so as not to have to wear glasses taking pictures obscuring the framing. I even have a double backup-copy of each model I own (Yes I know that is being totally silly) just to make shure I can go on taking pictures when one breaks down. But one thing I wouldn't specifically propose is to invest in an OM-2 camera for night photographie: it shuts down after 2 minutes. An OM-2n should stay on a minute longer or even shuts down at 30sec depending on the fault it has after 20plus years. Nikon FE cameras can handle hours, and have pre firing mirror lockup when using the self timer, which is a feature only om-2SP and onward models have. Anything within 30 seconds of course is very nicely handled by the OTF measuring feature. Bruce I hope you'll find an dioptric corrector for your OMs and keep on making these great shots! I've found the OM2n's longest auto exposure to be OK for much of the night stuff I do but I suppose it depends on how dark your normal scene is. 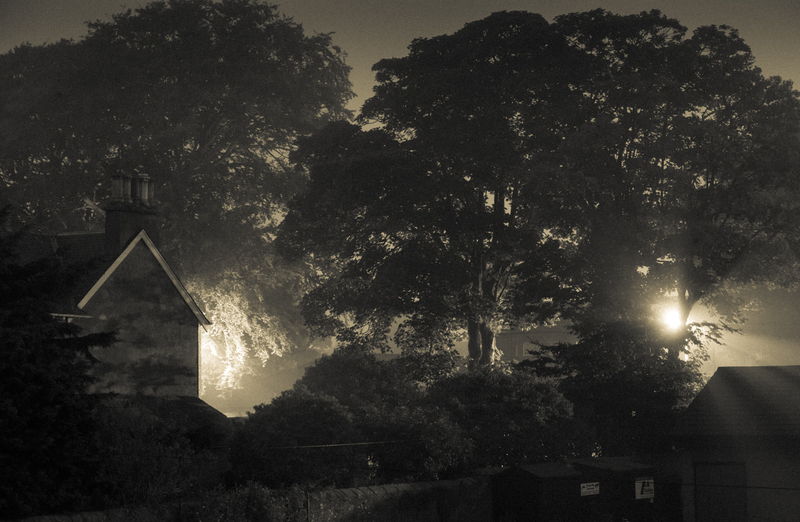 I quite like scenes where there is some street lighting and either mist or low cloud cover. Remember, though, that the "B" setting isn't battery dependent so you can leave the shutter open as long as you want without using up battery power. I must look into old glasses trick for the viewfinder!